Our CarCaddy Electric Car Pusher is battery operated and designed to push cars and vehicles that have pneumatic tires, such as cars, trucks, campers, and buses. It can push cars and trucks up to 20,000 pounds on flat ground and up to 10,000 pounds on 3% grade. And if that is not enough, you can opt for a Heavy Duty Motor/Transaxle Power Upgrade so you can push cars and trucks that weigh up to 50,000 pounds. You can also opt to add foam filled tires, snow and ice tires, a safety horn or a flashing light. Keeping valuable employees injury free and keeping cars free of damage is the only way that a busy car lot or mechanic shop can effectively keep up with these increases in business. Customers don’t want to experience excessive delays when their cars are being serviced and few customers would be willing to pay sticker price for a car that has been unnecessarily damaged on the lot. 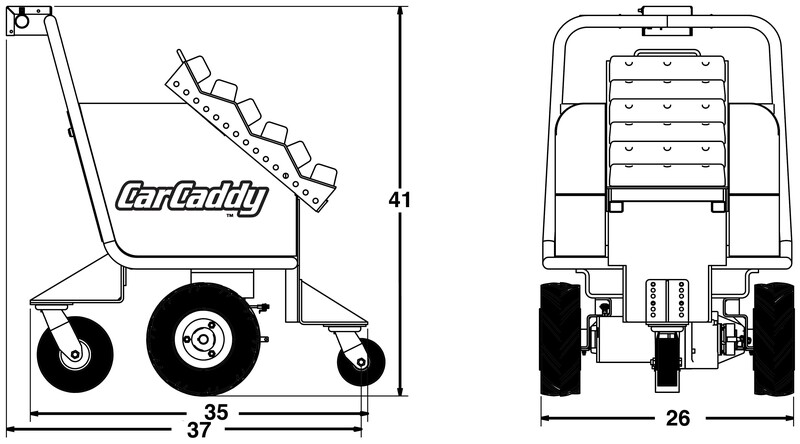 Investing in a piece of equipment like the CarCaddy electric car pushers increases productivity at the same time that it reduces the risk of damage and injury. This allows auto lots and mechanic shops to keep up with increases in volume, improve service levels and generate additional profits. Many vehicle manufacturers use a CarCaddy car and vehicle pusher to push the units short distances down a production line from station to station. A CarCaddy also has plenty of power to push a stalled vehicle at service centers or along highways. The primary benefit of using the CarCaddy electric car and vehicle pusher is to prevent the strains associated with pushing stalled cars, buses, heavy trucks, and other vehicles. Overextending the body when manually pushing cars from the parking lot into a service center garage can be extremely harmful to the worker, as can pushing a stalled vehicle from the highway to the shoulder. When a car and vehicle pusher is used for these routine tasks, damage to the body (including back and shoulder strain) is minimized, which keeps employees healthy and reduces workers’ compensation. The Car Caddy also prevents damages associated with moving these stalled vehicles using another vehicle. In cases where manpower is not available, other vehicles are used to bump up against the back end of the stalled vehicle. Both vehicles can be dented, scratched, or cracked due to this practice. The front push pad of the Car Caddy car and vehicle pusher is made of a soft, durable, padded material designed to preserve the paint and integrity of the back end of the stalled vehicle while also protecting the car and vehicle pusher. The limited warranty covers defects in material or workmanship in all of the DJ Products Products for the stated warranty period from the date of delivery. DJ Products will repair or replace any Product, which proves to be defective in materials or workmanship during the limited warranty period. This limited warranty does not apply to any damage caused by a carrier, nor to any alterations of the Product not expressly authorized by DJ Products and in conformity with applicable Product specifications and use limitations. This limited warranty does not extend to any Products which have been damaged as a result of accident, misuse, abuse, normal wear and tear, acts of God or other contingencies beyond DJ Products control, or as the result of service or modification by anyone other than DJ Products. EXCEPT AS STATED ABOVE, ERGOSOURCE MAKES NO EXPRESS OR IMPLIED WARRANTIES AS TO ANY PRODUCT, AND, IN PARTICULAR, MAKES NO WARRANTY OF MERCHANTABILITY OF FITNESS FOR ANY PARTICULAR PURPOSE. The remedies of the Purchaser set forth herein are exclusive, and the total liability of DJ Products with respect to the Products furnished, whether based on contract, warranty, negligence, indemnity, strict liability or otherwise, shall not exceed the purchase price for the Products upon which such liability is based. DJ PRODUCTS SHALL IN NO EVENT BE LIABLE TO PURCHASER FOR CONSEQUENTIAL, INCIDENTAL, INDIRECT, SPECIAL OR PUNITIVE DAMAGES ARISING OUT OF ANY BREACH OF THE LIMITED WARRANTY OR ANY DEFECT IN, FAILURE OF, OR MALFUNCTION OF THE PRODUCTS FURNISHED HEREUNDER, WHETHER OR NOT SUCH LOSS OR DAMAGE IS BASED ON CONTRACT, WARRANTY, NEGLIGENCE, INDEMNITY, STRICT LIABILITY OR OTHERWISE. DJ Products shall not be liable for consequential, incidental, indirect, special or punitive damages even if the limited remedy afforded herein fails of its essential purpose; the express intent of the parties being that the risk of all such loss or damage shall be borne the Purchaser and/or Purchaser’s insurer.